It was a beautiful mix of mountains and sea. 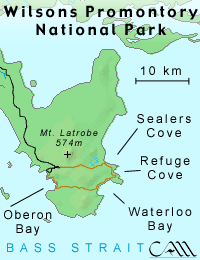 A geographic feature known as a promontory (like a peninsula) juts out just 3 hours southeast of Melbourne to form the southern most tip of the Australian mainland. Carl, Pete, and I finally got away from the city and pulled into a rainy carivan park, found a camping site around 9pm and set up our tent on the soggy ground. It continued to rain through the next morning as we packed up and set out on a 40 km journey over hills, along beaches, up peaks, and through valleys. The clouds moved on over the next night and the second day was clear and beautiful. It nearly transformed the land to a tropical paradise with terquoise blue water and sparkling white sand beaches. As we arrived back at the car, the rain caught up with us again and greyed the sky over like the day we started. Full circle, with wonderful discoveries along the way.